the alexandria, la. mayor and city council, who settled their fraud suit against cleco and especially the alexandria, ratepayers probably dont want to read this. This case involves the consolidation of four writs into a single writ opinion. Two of the writs, numbers 11-348 and 11-349, were filed by Cleco Corporation and Cleco Power, LLC (“Cleco”). 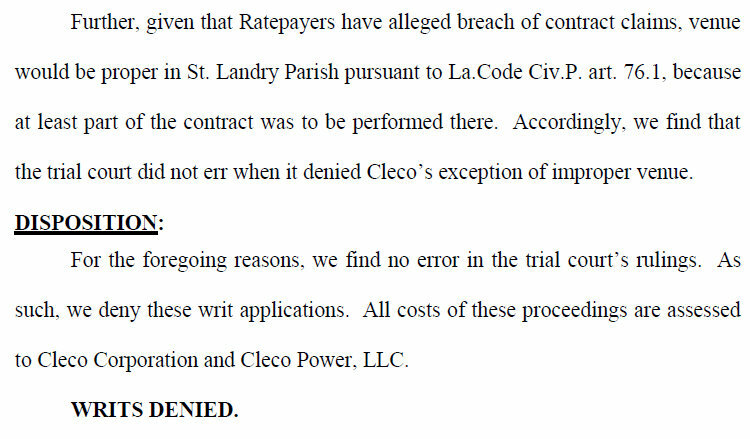 The other two writs, numbers 11-391 and 11-392, were filed by the Louisiana Public Service Commissioner (“the LPSC”), as intervenor in two separate class action suits which have been filed against Cleco by a putative class of utility ratepayers (“Ratepayers”) in the City of Opelousas. Ratepayers seek reimbursement for alleged overcharges for electricity for a period of nearly twenty years. In response to both lawsuits, Cleco filed exceptions of lack of subject matter jurisdiction, prematurity, and improper venue. 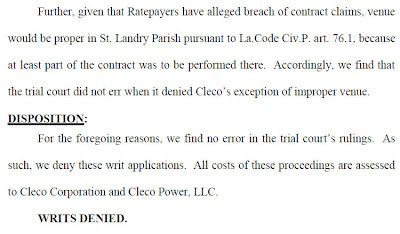 Following a hearing, the trial court denied Cleco’s exceptions. We find no error by the trial court and, thus, deny these writs. the suits are opelousas trust authority d/b/a opelousas general health system, et al. 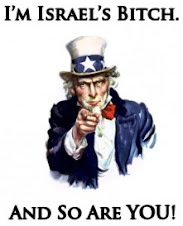 vs. cleco corporation and cleco power, llc and deborah mayo, et al. vs cleco corporation and cleco power, llc.